From working in Thailand as a teacher for the last 6 months, I thought I would give some insight into my typical day at school. To start with, I am in an all-girls private school in the centre of Bangkok so my experience will be very different from others who have taught in Thailand. My week consists of teaching 25 periods a week, which are 50 minutes long. I teach a variety of ages and subjects. I have the Special Intensive English Programme (SIP) students, Pathom 2 (aged 6-8), 12 times a week, teaching English (5 periods), Maths (4 periods) and Science (3 periods). Then I teach 2 classes of Pathom 2, both Maths and Science, 1 period of each a week. I have 3 classes of Matthayom 2 (aged 13-14), teaching English Conversation for 1 Period a week. Finally, I have 3 classes of Matthayom 5 (aged 16-17), teaching English Conversation for a double period a week. In Pathom classes, I have around 30 students, where a Thai teacher might turn up and sit at the back of the class, but other than that I have the whole class to myself, speaking only English to Thai-native speakers. My Matthayom consists of 15-18 students, with no sign of any Thai teacher, and there English is limited. I can speak to my SIP2’s more than my Matthayom students as can speak and understand more English. On a typical day, I leave my condo around 10 past 7, where I walk about 20 minutes to get to school. I stroll in the main gates, Wai the teacher on the door and walk around to the office to sign in with my fingerprint and signature. Across the school to the Pathom side, I climbing the stairs to the 4th floor, where the foreign teacher office is. Here, I fill up my water bottle, drop off my bag, plug in my computer and get ready for the day’s lessons, while feeling sweaty as the air-con is not allowed to be on until 8. Then all the teachers and students fill the main area for assembly, with the student of all ages sit on the floor in rows in their classes. Assembly starts with the National Athem, where we stand straight looking forward, while a Thailand flag is raised and everyone sings. 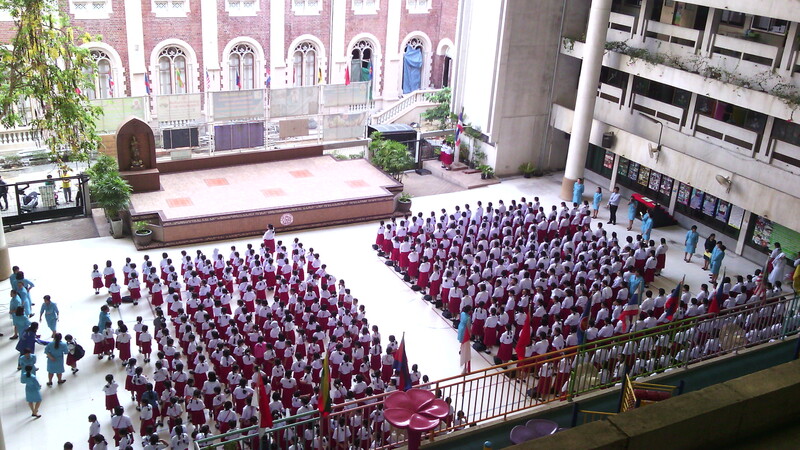 After, a Catholic prayer is said in Thai then a song played with the students clasping their hands together. The pupils all sit on floor, while either a teacher talks to them or students perform a sketch (sometimes in English) to the whole school. Recently, the student then do a couple of minutes of meditation with a peaceful, calming song is played. After assembly, lessons then start at 8.05, where they have 2 lessons, homeroom period before break. In both Pathom and Matthayom, the pupils are taught by different teachers in a majority of their subjects and the students stay in the same classroom (except for music, swimming and PE). The students have individual desks with a drawer for their books and the desk are usually put into 3 or 4 columns facing the huge whiteboard and TV screen at the front of the class. Each classroom has a teachers desk, a computer linked to the TV (except for Matthayom 5/6, where the teacher has to plug in their computer) and air-con. When I enter the class, all students stand up to greet me by Wai-ing me and saying ‘Good Morning Teacher’. I usually say ‘Good Morning, how are you?’, where they will respond robotic-ally ‘I’m fine, thank you, and you?’ It makes me laugh everytime. However, majority of my student now will say something different to ‘I’m fine’, when speaking to me. The students then sit sown, while I set up the computer for the lessons, getting powerpoints, timers, games, YouTube clips ready. In my Pathom classes and Matthayom 2, I normally start my lesson with a starter game, which will revise previous material. I split the class into groups, where I shout ‘Team 1, team 2 etc’ and they repeat back. When the students answer the question, they put up their hands and I will choose someone. Majority of the time, I will choose someone with their hand up but sometimes I try to choose pupils, who are either misbehaving or are too shy. After the starter, I will introduce new vocabulary or grammar, where I would have a picture on a PowerPoint to see if anyone knows the word. If not, I would show them the word, say the word and get the whole class to repeat several times. Once I have gone through the words once, I would go through again to see if they remember the words. Usually, I would turn this into some sort of a game to keep them enthusiastic. Next comes the activity, which usually varies depending on subject and topic. Sometimes they complete material in their workbooks, or do an activity in a notebook, which I write on the board or another making task. At the end of the lesson, we finish off by doing a cool-down activity, usually going through something we have done in the lesson. The children then put always paper and stationary. Before I leave, the student stand up again to say ‘Thank you and goodbye’. My English Conversation lessons for Matthayom 5 students have a slightly different layout as they are older. I still start with some sort of a game to review previous material but I make it active so they have to get out their seats. Even though most of them don’t enjoy moving, it gets them interested and engaged in the lesson. I then will introduce the topic for the double period, and find out what they already know so that I can add to this knowledge. Again, I will introduce new vocabulary, where they will do some sort of activity with the new vocabulary. As a class, we will go through the answers and I will see if they all understand, which can be difficult as they often copy each other and rely on those who are better at English. Next, I go through a conversation or piece of text about the topic, where majority of the time the class will read as a class. We try to talk about this and they answer questions on it verbally. The next activity consists of the students being in pairs and writing a conversation between two people about the subject. I walk around the classroom, making sure their grammar is correct and that the sentences make sense at the same time as initiating some sort of conversation with them. After, each pair read me their conversation to me so I can hear their pronunciation and correct any mistakes. After break, they have one more lesson before lunch. Usually for lunch I eat in the canteen, where I first exchange money for tokens, then scout out the food options. In our school canteen, there are four different sections: different noodles with soup, rice with a variety of toppings, snack and drinks, and ice-cream. The food at the school is extremely cheap, like 20 baht for a rice and topping. Depending on the time I get down stairs, sometimes I have to queue in the same line as the children. Teachers don’t get any sort of privileges. Actually often the lunch workers give us bigger portions. I would sit down with the other farang teachers and majority of the time some students from SIP4 join us and chat with us. For the rest of the afternoon, there are four more classes before finishing school. When I am not teaching, I am in the foreign teacher room, planning and preparing lessons. Very interesting read. Nice to get a real day to day perspective!